The splendid beauty of the southwest of Mallorca emanates from the Serra de la Tramuntana, this dramatic mountain face which subsides towards the sea. Carob and almond trees, figs and olives are glowing in the enclosed valleys, surrounded by impressive mountain ranges. Embedded in this spectacular scenery, between mountains and water, you’ll find the boroughs of Calviá and the town of Andratx. 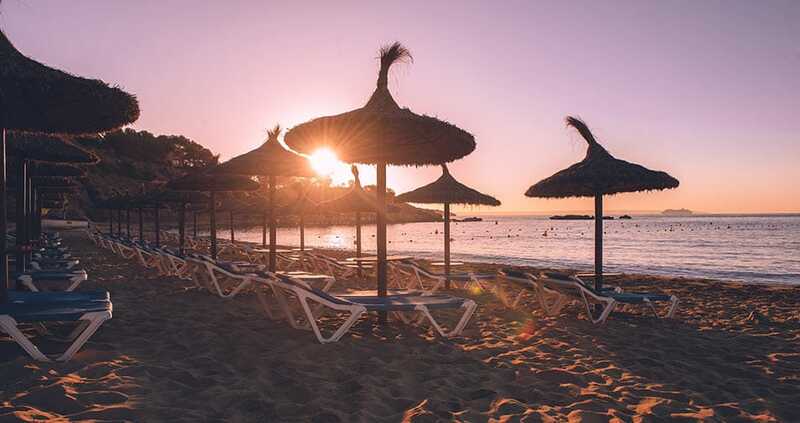 Many of the villages, which are just off the Carretera de Andratx, like Illetas, Palma Nova, Magaluf, Santa Ponsa, Peguera or Camp de Mar, offer fine sandy beaches and a well-developed infrastructure. Others are hidden by rocks and can be more difficult to access. The water in the stony bay of Cala Llamp, which is just behind the mountain range of Port Andratx, is crystal clear and splendid for snorkelling. The bay has no beach, but offers a restaurant, a café bar and a seawater pool. Even in high season some of the smaller bays in this area are virtually empty, due to the difficulty of access. An adventure tour through the trees and shrubs along the cliff face may not be everyone’s cup of tea, but is highly recommended for spectacular sea views and to escape the crowded beaches. Head towards Portals Vells, south of Magaluf, one will find a nice, if somewhat overpriced restaurant on the beach for lunch. 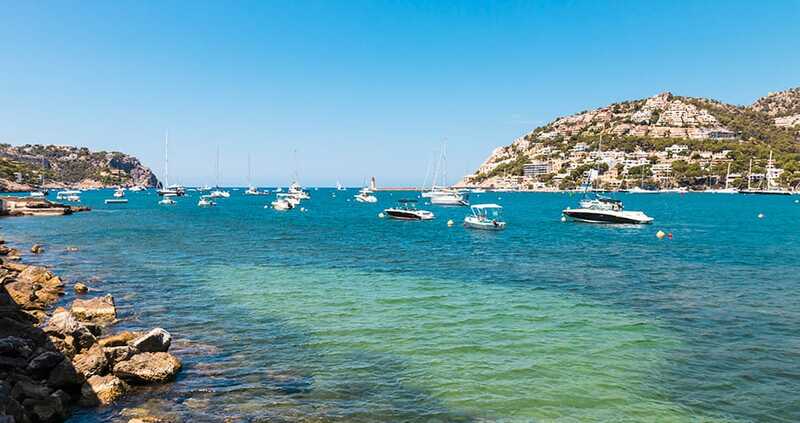 Another option is to go to Cala Fornells, east of Peguera. There is plenty of entertainment for all. Kids – as well as the grown-ups – will love the slides at the Western Water Park which is located in Magaluf, the largest and most exhilarating of slides being the big El Látigo slide. For those seeking tranquility, diving is paradise. If you are looking for a peaceful adventure, you will find many beautiful underwater plants in the clear waters surrounding Mallorca. The diving centres in Andratx, Illetas, Portals Nous, El Toro and San Telmo are well-equipped and offer diving lessons for beginners and advanced divers. 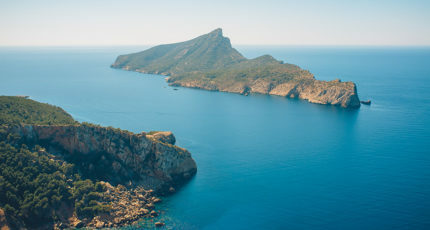 These include dives to shipwrecks or underwater caves off the island of Dragonera, one of Mallorca’s national parks which can also be visited by boat. From May to September, the charter boats commute several times a day from San Telmo to Dragonera, which is the most westerly point of Mallorca. It is a real paradise for endemic saurians and birds like the coral seagull and Eleanor falcons and, of course, the ornithologists. Sailing is one of the main attractions not only for the experienced sailor, but also for beginners. The sailing schools in Puerto Portals or Cala Nova, for example, offer a variety of courses for children of all age groups. The school of Cala Nova is proud to have given the first sailing lessons to the children of the Spanish Royals many years ago. 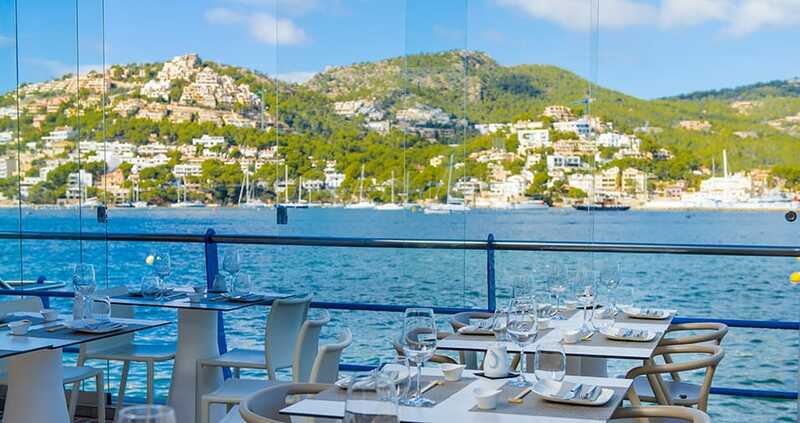 Before or after a maritime excursion the yacht harbours of Portals, Port Adriano or Santa Ponsa offer ideal venues to relax and enjoy a café con leche. Should you be less enthusiastic about water activities, there is no lack of alternatives. Almost every village has its own tennis courts. Some of them have developed into clubs, offering bouncy castles, slides and outdoor pools, so that the little ones are occupied while you’re practicing your serve. Rates for court hire are moderate, and the bookings are quick and easily done. If you prefer to let someone else do the running, then horse-riding could be a nice alternative. Horses can be reserved on a per day or per hour basis from the many riding centres on the island. On horseback, you’ll have the experience of the “wild” southwest – even though you are in the middle of a well-developed and densely- populated area. The valleys and gentle hills are not only the perfect setting for riding, but also for hiking, walking and biking tours. The Passeig Calviá, which is a walking and cycling lane for buggies, joggers, rollerbladers and scooters, leads from Illetas to El Toro. In regular intervals there are playgrounds for the kids. In Puerto Portals, Marineland is waiting to be discovered. It is a combination of zoo, aquarium and small leisure park and has fantastic dolphin and parrot shows. An all-year activity is playing golf. No less than 5 of the multiple well-kept golf courses are in the communities of Andratx and Calviá and the courses of Son Vida and Muntaner are within easy reach (15 minutes by car). If you follow the mellow curves on the road from Palmanova, over Calviá to es Capdellà and Galilea, you’ll find yourself in a different world. 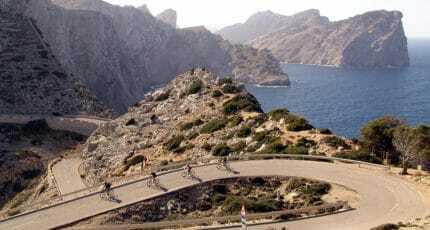 For those who love hiking and cycling, this is the ideal spot. One of the most beautiful hiking tracks leads from San Telmo to the former cloister Sa Trapa. Here you’ll have the most beautiful views over the Cala Basset. Don’t forget to bring your picnic if you go for a hiking tour, or let yourself be tempted by one of the many gastronomic options available on route. The town councils add a lot to the activities on offer. The public facilities in Magaluf, Santa Ponsa and Paguera provide football fields, fitness, dance and aerobic spaces, exterior sprint lanes and playgrounds or adventure walls. 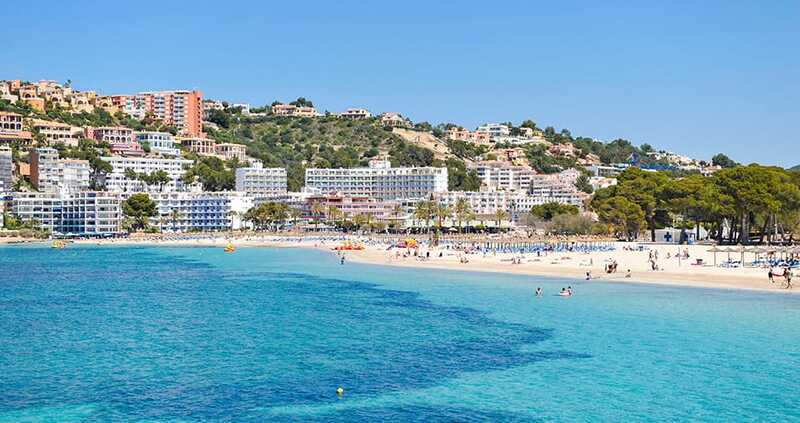 In addition, Magaluf has tennis and squash courts as well as a public swimming pool. In Bendinat, children’s swimming lessons and aqua gymnastics are held in the public indoor pool. Both Calvià and Capdellà have public swimming pools and sports facilities as well. It is always worthwhile to have a look into the municipal information brochures. The programs offer a wide choice of activities from language courses to pottery-making, and all activities offered by these communities are generally inexpensive. Those residents who are registered in the individual parishes benefit from additional discounts. If you would like to sample some culture, the Townhall of Andratx is located in the ancient palace of Son Mas with its small botanic garden. Close to Port de Andratx is the CCA Andratx located in a monumental building offering exhibitions from contemporary artists. An inviting café and the beautiful, large garden make the CCA Andratx a worthwhile visit, especially for those not living on the southwest coast. Those who are lucky enough to live in this area can relax and enjoy the early spring sunshine and the breathtaking views of the Galatzó mountain. Next time you venture out, why not try ballooning, free climbing or a quad adventure? If there is an activity not found on your doorstep, you will not have to look far to find it. We hope you have found this article about the Leisure Time in the Southwest useful and that you have many memorable stays in Mallorca as a result of our recommendations.